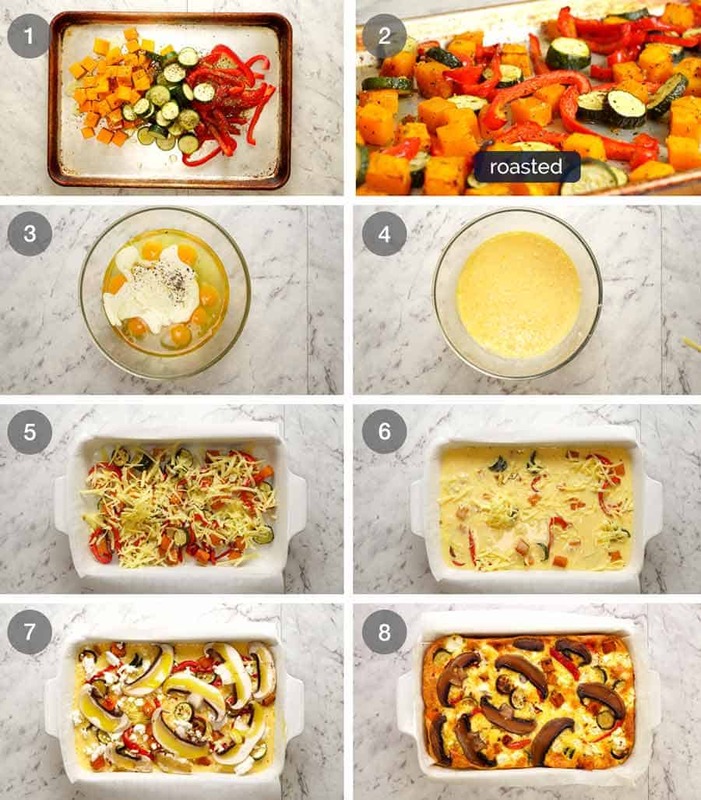 Baked Vegetable Frittata is the easy way to make frittata – just pour everything into a baking dish and pop it in the oven! It tastes like a crustless quiche, and it’s just as great fresh out of the oven as it is 4 days later. Loaded with herb garlic roasted vegetables, take this to work, make it for breakfast, brunch, or dinner. Use my frittata recipe formula to make this your own – try chicken, ham, spinach and artichoke, salmon and broccoli, or Tuscan antipasto! Traditionally, frittata is started on the stove then transferred to the oven to finish cooking. This is the way I cook frittatas if I’m sautéing bacon or similar – so I can cook the frittata in the bacon fat (SO GOOD!). But when I’m not, I make it entirely in the oven which is how I make this Baked Vegetable Frittata. This is the easier way to make frittata – just plonk everything in a baking dish, pop it in the oven and out comes something that looks very much like a quiche – minus the (calorie-loaded-totally-delicious-buttery) crust! This is the easy way to make frittata. Just pour the egg mixture into a baking dish and bake! 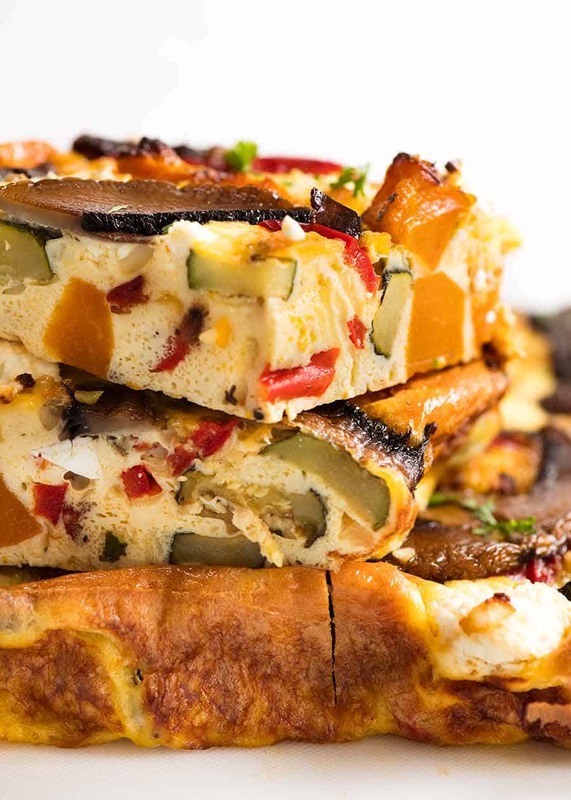 This Baked Frittata recipe I’m sharing today is a Vegetable Frittata. 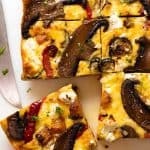 It’s loaded with quite a volume of fresh veggies roasted with garlic and dried herbs – so you can feel good knowing you’re inhaling a good amount of vegetables in the form of this custardy, cheesy frittata slice. 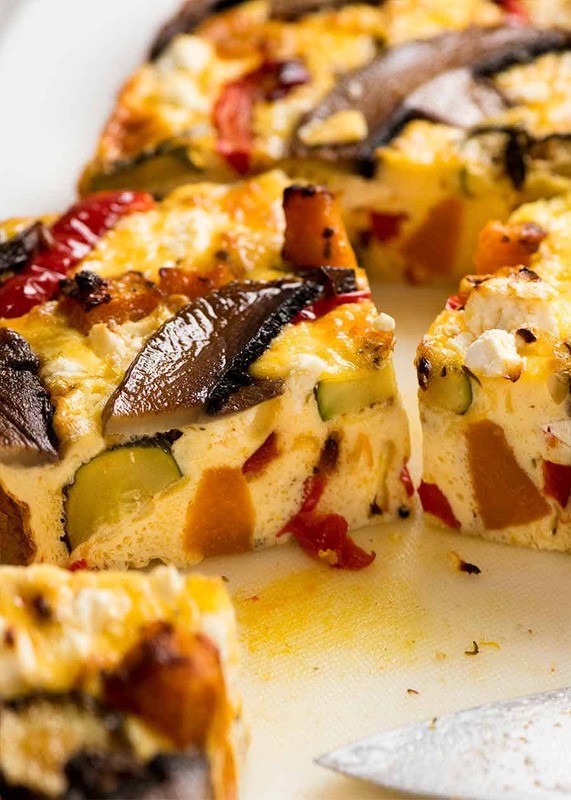 Pumpkin, zucchini and capsicum is a great combo in frittata – for taste and the colours! 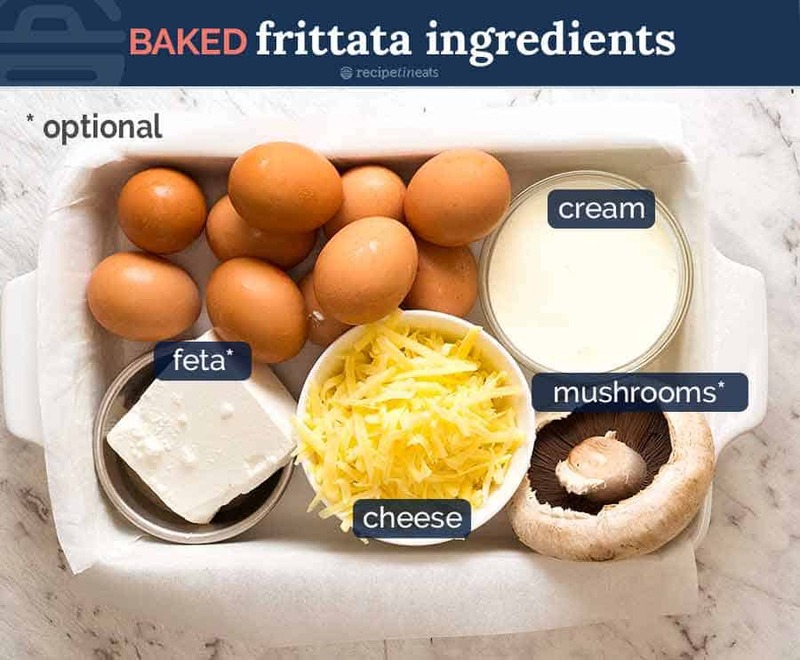 For the actual frittata itself, all you need is eggs, cream or milk, cheese, salt and pepper. Whisk, pour into the pan over all the “stuff” and bake – that’s it. 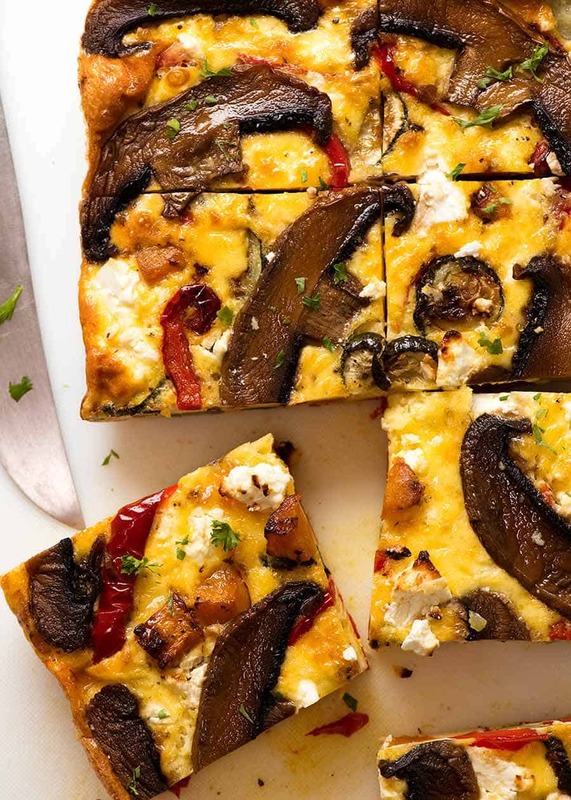 I like to top my frittata with mushroom and feta for extra flavour and also because it looks so great! But these are entirely optional. I used a giant mushroom because they were unusually good value at the time – but any type of sliceable mushrooms will work here. I roast the vegetables on a high heat because they’re cut pretty small and I want to get a nice caramelisation on the edges. Because colour = flavour and I always feel that’s especially important for vegetables (nobody likes soggy bland vegetables). Crumble over feta and finish with mushrooms drizzled with oil – again, this is a visual thing because don’t the mushrooms look AWESOME???!!!! All the layering work done, shove it in the oven and go back to watching Food Network, Game of Thrones or whatever it is that you’re binge watching on Netflix at the moment. This is a hands-off bake job! I take it back. Mushrooms are not optional! I know I said giant mushrooms are optional. In fact, I said mushrooms are entirely optional. But I take that back. It might be my favourite part about this Vegetable Frittata. If you come over for brunch, don’t be surprised if you’re served a piece of frittata with a big bare patch on the surface where the mushroom used to be……. I seriously even considered covering the ENTIRE THING with mushrooms. But – golden cheesy surface. Crumbled feta. Browned mushrooms. We must be fair and make room for them all. Make this breakfast today, tomorrow and 4 days later. Make this to put into lunchboxes. Make this to stash in your freezer. Recipe video above. This tastes like a crustless quiche! Soft and custardy on the inside, flavoured with a sprinkle of cheese and feta, studded with Roasted Herb Garlic Vegetables and . SWITCH the veggies with 5 – 7 CUPS OF ANYTHING you want: cooked chicken, flaked tuna or salmon (fresh or canned), other vegetables, antipasto type things. See post for more ideas! Preheat oven to 220C/430F (standard) or 200C/390F (fan). 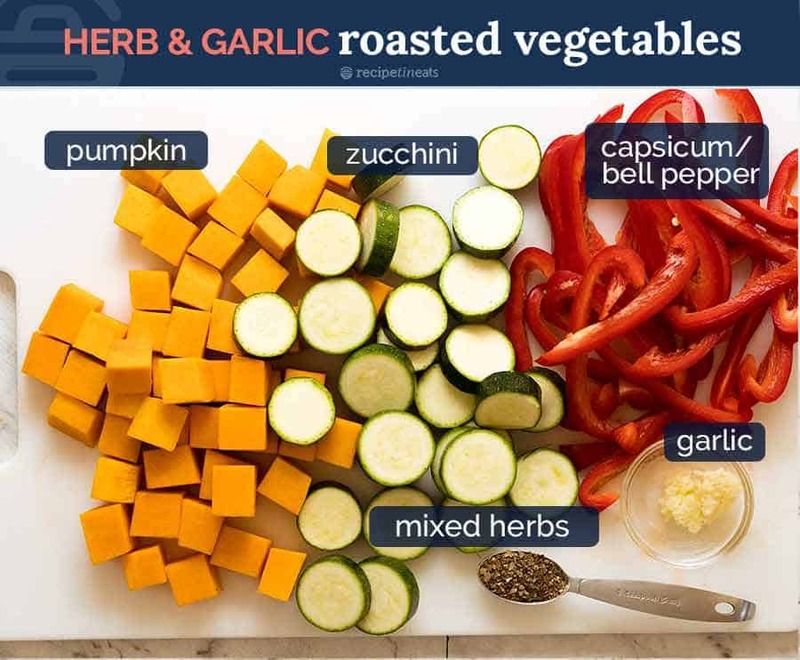 Toss vegetables on tray with oil, garlic, herbs, salt and pepper. Spread out. Roast 25 minutes, undisturbed (no flipping). Lower oven to 180C/350F (standard) or 160C/320F (fan). Whisk eggs, cream, salt and pepper in a bowl. Place most of the vegetables in the prepared pan. Pour over egg mixture, sprinkle with cheese, then top with remaining vegetables. Top with crumbled feta, then mushrooms. Drizzle mushrooms with olive oil. Bake 35 to 40 minutes until centre is just set. Use paper overhang to lift out of pan, then slice into squares and serve. Serving later: Cool on rack (otherwise base gets soggy). Cut then refrigerate up to 5 days, or freeze. Reheat in microwave for 30 seconds. 1. Cream makes it silkier and richer than milk, like quiche. But milk works just fine! Full fat better than light but light is also just fine. 2. Vegetable switch outs: 5 to 7 cups of any roastable vegetables of choice, OR anything else you want to put in: cooked chicken, flaked salmon (fresh or canned), ham, antipasto type things (olives, chargrilled peppers, artichokes). 3. 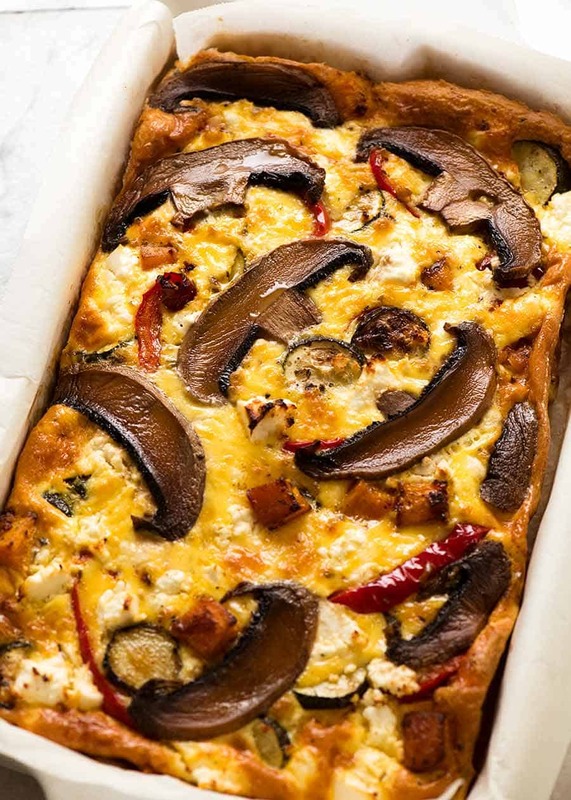 Pan size – don’t get too hung up about pan size, if your pan is smaller then make yours a rdeep dish frittata. If there’s overflow, stop pouring egg mixture in and put the leftover in a ramekin. OR use the recipe scaler (tap /click servings and slide down) – for a 20cm/8″ square pan, slide down to 8 eggs. Just don’t use a pan that’s much larger otherwise your frittata will be disappointingly thin. 4. Nutrition per slice, 8 servings (pretty decent size piece). 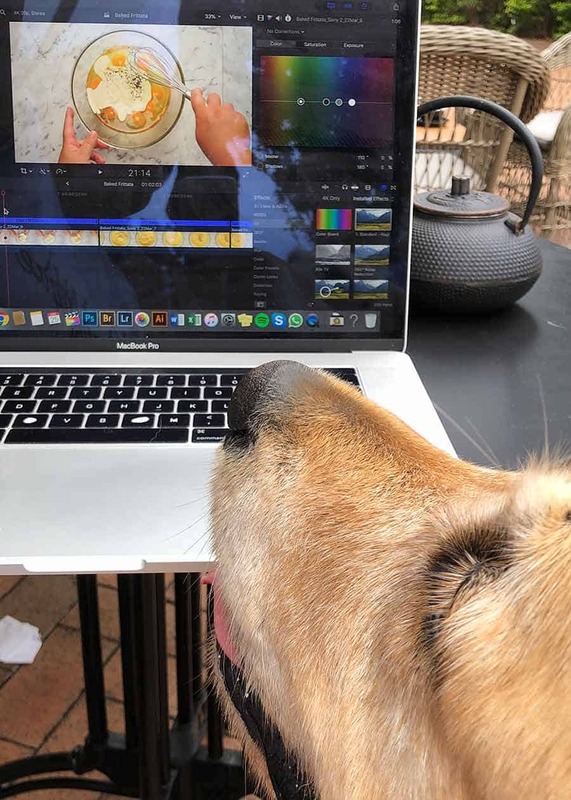 I WISH he could actually HELP me make recipe videos rather than just DROOLING on the keyboard!!!! The post Baked Vegetable Frittata appeared first on RecipeTin Eats.